Erick Sahler likes authenticity. He’s traveled across the country several times, getting a first-hand look at the sights others see in books. In his garage is a Nixon-era Chevrolet Camaro, its lines and curves as much art as transportation. His dear-departed dog was a Chesapeake Bay Retriever, a nod to a region he has always called home. More than a decade ago, he wrote a newspaper column about how organizers of a storied community dinner couldn’t decide on continuing with whole canned tomatoes or switching to diced tomatoes. His argument was one of authenticity, not practicality. It takes a number of people to peel and core the whole tomatoes, and the process builds bonds and communities — and saves traditions. 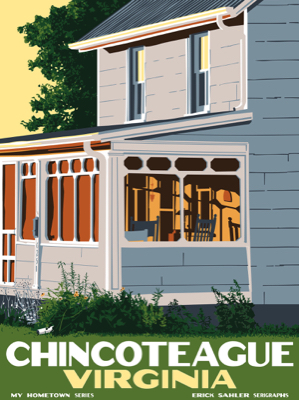 So when Sahler expresses his fondness for Chincoteague Island, it is because of its rustic scenes, veritable culture and longstanding traditions — authentic qualities he admires. Sahler conveys that feeling in another authentic medium — hand-pulled, silk-screen paintings, each one an original work of art. 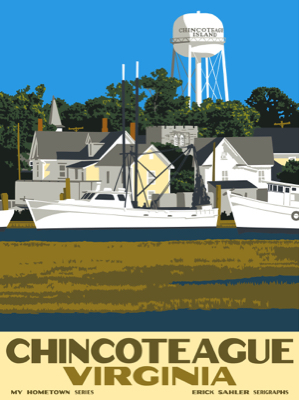 Over the years, his business, Erick Sahler Serigraphs Co., has captured the scenes of Chincoteague, Assateague and Wallops islands with vivid color and an artist’s eye. A new piece always debuts at Sundial Books, on Main Street, Chincoteague, on Memorial Day weekend. This year’s newly finished work is a silk-screen painting of the 10-foot-tall, Adirondack-style “Love” chairs that grace Robert Reed Memorial Park. There have been more than a dozen Eastern Shore of Virginia-oriented silkscreens produced by Sahler. The pieces that are not out of print are available as framed artwork, postcards and magnets at Sundial Books, whose owners, Jon and Jane Richstein, have developed a longstanding relationship with the artist. They are also among his biggest fans. “Erick’s love for the people and places of the Eastern Shore is evident in his craft,” said Jon Richstein. His past Eastern Shore of Virginia pieces are homages to the Assateague Lighthouse, Island Theatre, Chincoteague oysters, the old swing drawbridge and many more. In one, an island sunset is reflected in the screen porch of a Chincoteague-style home. The formal name for a silkscreen image is “serigraph,” and Sahler learned the medium when he caught on with a T-shirt designer as a summer job as a teenager. These days, Sahler produces the original images and cuts the screens — one for each color — before the arduous task of pulling each single color over the screens, allowing them to dry, and then pulling another color. Each color is pulled twice to create a vivid image. Except for some periodic help from his family — Sahler and his wife have two daughters — he does it all himself. His serigraphs also depict communities around the Delmarva Peninsula — Salisbury, Berlin and coastal scenes from places including Rehoboth Beach, St. Michaels, Fenwick Island and more. The result, combined with Sahler’s classic lettering, has historic feel. With the black frames — Sahler does all his own framing — the perfect-for-hanging images are a keepsake of a favorite Delmarva town. A Salisbury native, Sahler earned a degree in graphic design from the University of Maryland Baltimore County and caught on at The Daily Times newspaper as a page designer and artist. He eventually rose to the position of managing editor before deciding to make the leap as a commercial artist in 2011. Some of the advice he received was ominous: “You’ll never get rich working for someone else but you’ll get poor really fast working for yourself,” a friend told him. Seven years later, Sahler is neither, but his artwork has stood the test of time. He’s been profiled in The Wall Street Journal, USA Today and others. He will be one of the 30 featured artists at The National Folk Festival when it comes to Salisbury, Md., Sept. 7-9. He’s an Illustrator Member of New York’s Society of Illustrators. Maryland Gov. Larry Hogan owns his work. It is quite a story, said Jon Richstein. “He makes a leap of faith and becomes an artist, giving up a regular job to do so,” he said. Today, Sahler is an unofficial ambassador for Delmarva, it would seem. He was in Cambridge, Md., recently when nine of his prints were featured at the Dorchester Center for the Arts. His illustration depicting Harriet Tubman is on permanent display at the research library of the Harriet Tubman Underground Railroad Visitor Center in Church Creek, Md. Recent releases include the historic Robert Morris Inn in Oxford, Md., and the Ward Museum of Wildfowl Art in Salisbury, Md. 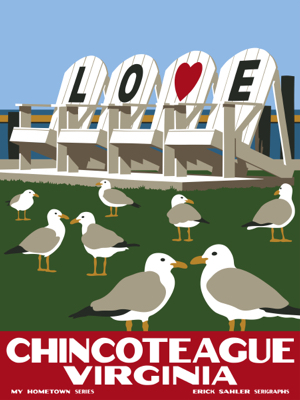 But a piece of Sahler’s heart is always on Chincoteague, a town he describes like none other on Delmarva. “It’s always a magic trip for me to get on Route 175,” he said of turning on Chincoteague Road at T’s Corner and heading for the island. “There’s a kid in all of us that feels excitement looking at the Wallops complex. But then you leave that all behind and you see Chincoteague in the distance.